To miss this movie on the true meaning of religion is a crime for any cineaste. How much poorer one would be if one allowed this penetrating masterpiece to pass by without a standing ovation! Debutante director Bhavna Talwar paints a map of the human heart in confident, bold, vibrant but gentle strokes. Varanasi, the city of holy dreams and unholy nightmares and the clash between old world values and new world connivances, has seldom been captured with such exquisite and tender splendour. Straddling this world of colossal pain and redemption, as defined by the individual's desires and emotions, is Pundit Chaturvedi (Pankaj Kapur). 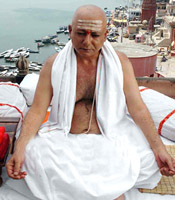 Pot-bellied, bare-torso, Chaturvedi is a symbol of religiosity who could easily have become a parody in lesser hands. In the first half-hour of this tightly-wound homage to the aroma of incense on the angry ghats (banks), the director establishes Chaturvedi's rigidly ritualistic world as qualified by the priest's own dormant, tolerant take on humanism. The dawn scenes depicting the unruffled priest striding briskly through the gallis (lanes) of Varanasi with huffing disciples in tow, as he's accosted by a sneering, conniving opponent (Daya Shankar Pandey), are designed in vibrant colours bringing alive the predominance of ritualistic religion in a city that's submerged in subtexts. The dramatic focus of the plot emerges when a baby is abandoned at Chaturvedi's doorstep triggering off what can only be called a conflict between religious compulsion and the individual conscience culminating in one of the most rousing and radical denouements on religious bigotry and communal prejudice put on screen. The narrative is driven deftly forward by a powerful script (Vibha Singh) and an editing pattern that embraces austerity at a time of tremendous dramatic excesses in the plot. What truly holds up this taut tale and rescues it from becoming perched on the ruinous precipice of polemical pirouette is the debutante director's vision. Talwar's vision encompasses both acute sensitivity and immense compassion. The pulls and pushes of an ancient religion that remains dynamic in spite of its dark decadence, emerge in scenes that are written not to impress us with drama but to underscore the spiritual underbelly of the plot. Note the tangential appearance of a sub-plot where a girl from the priest's family (Hrishita Bhatt) elopes with a foreigner. Here, as in several other lucid passages depicting the clash of the modern and the revered, the narration refuses to be judgemental. Instead we get to see the city in all its tender splashy splendour without smirk, sob or sigh. Above all, "Dharm" works because it is at heart, a humane story. My favourite scenes in the film are the ones within Chaturvedi's domestic domain. The bonding that grows between the priest and the abandoned five-year old (Krish Parekh) is warm but sparing. You watch the father-foster-son relationship grow through a play of heart-warming emotions that don't assail your senses. There's a similar holding-back in Chaturvedi's scenes with his devoted, docile and yet assertive wife, played with rare compassion by Supriya Pathak. Brahminical arrogance meets a compassionate world-view in Talwar's extraordinary portrayal of humanism, kinship and tolerance. The debutant director's penetrating take on how grim it is in the land of the divine and the crass, wouldn't have worked were it not for Pankaj in the central role. As the head priest caught in a terrible dilemma that questions his entire ethos and commitment to society and religion, Pankaj ceases to be an actor once the camera switches on. The supporting cast is extremely supportive. 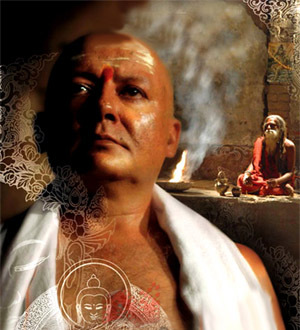 No assessment of "Dharm" can be complete without saluting the cinematographer S. Nallamuthu, art designer Wasiq Khan and the theme song sung by Sonu Nigam. All these add an extra dimension to this extraordinary film on the passing forth of an era and culture as seen through the eyes of a god-head who finally believes reform is the only religious order worth pursuing. Let's stand up and applaud the director of this reformist mellow drama. "Dharm" could've been screechy, preachy and jarringly sanctimonious. Instead, it affords us a look into the soul of a wounded civilisation. It is an old fashioned typewritten transcribed screenplay (reminiscent in many ways of Yash Chopra's four-decade old "Dharmputra") written in words that are meant to reach into the remotest corners of the stoniest modern hearts. "Dharm" leads you into the light without making a song and dance of the process. Really, you can't miss this.